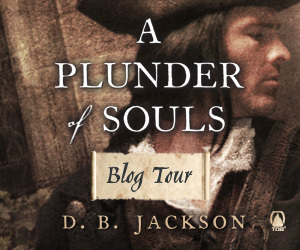 The first week of the Summer 2014 A Plunder of Souls Blog Tour is winding down, with this post, which is not on the official schedule, but which counts anyway. My Blog Tour, my blog, my rules. This was a quiet week -- next week things begin to pick up. I'll be visiting the blogs of Faith Hunter and Kate Elliott, and I'll also be a guest at Fantastical Imaginations, All Things Urban Fantasy, Black Gate, and Drey's Library. And I'll be starting a month-long appearance at my old virtual stomping grounds, Magical Words. There will be original content at all of these sites, so be sure to check in. For a complete listing of the blog tour appearances with links to the sites, go here. As the July 8 release of A Plunder of Souls approaches, I have also started my teaser countdown on Facebook. Yesterday I linked to the short story that serves as a prequel to the new novel. The short story is called "A Spell of Vengeance," and it can be found at Tor. com, where is was published in 2012. Also at Tor.com, you can find the first two chapters of the book. Starting tomorrow, and continuing on a daily basis until the release, I'll be adding passages from the book to my Facebook page. Finally, I would like to direct you to the appearances page on the D.B. Jackson website, which I have recently updated to reflect the latest plans for my signing tour, as well as another conference appearance, about which I'm very excited. In October, I will be an instructor at the Annual Conference of the South Carolina Writers' Workshop. I've attended the SCWW Conference several times before and have always had a great experience there. I'm looking forward to this year's meeting and hope to see many of you in Myrtle Beach. For more details, go here. That's all for now. Have a great weekend. And please preorder A Plunder of Souls!